Van Rock City news: garbage yard block party! A couple days ago we noticed people pitching pails of trash into the yard, and since then the flow of refuse has snowballed. 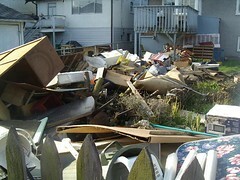 Yesterday we started seeing discarded appliances, and when the sun went down last night trucks and vans began arriving. At one point there was a lineup of vehicles in the alley waiting their turn to unload. One particularly bold family started hacking at the deck looking for usable wood, carting off the stairs and railings, rifling through the shed, carrying it all off on their cart to their house down the block. The yard is abuzz with activity — some dumping, others picking through the debris looking for goodies. It sure is fun when everybody gets together for a garbage yard! Update: Looks like the party’s over. This morning there was a group of people who entered the house, and engaged fairly openly in pre-demolition type activities. Either they are there on behalf of the legitimate owners, or they are a band of brazen yet methodical looters. Given my unbounded faith in humanity, I prefer to believe the former. 13 Responses to Van Rock City news: garbage yard block party! Is this a Canadian custom? I’ve never heard of it down here, at least by that name. If this is customary in Canada, BC, or in Vancouver I am unaware of it. This is the first I’ve seen of anything like this. This may be the funniest Abject Learning post ever. Too bad you don’t have the benefit of some geographical and sociological detachment from this particular phenomenon. Yikes. I found this a little chilling. I’ve never heard of anything like it before. It seems like “lawless” behaviour. The sort of thing that might happen after a (un)natural disaster. Well, let’s see, for starters we have trespassing, vandalism, theft, illegal dumping, littering…. The veneer of civilization is very thin indeed. I’m all for a bit of lawlessness in the ‘hood, but I must admit this episode does not leave me hopeful of what awaits us with a real natural disaster, such as that earthquake we’re expecting. What’s clear is that people have made a judgement that some developer will have to pay to remove the demolished house materials from the site, and this is a way they can avoid paying for their own refuse removal. As of now, the developer is not seen as a human being, just a faceless financial speculator. 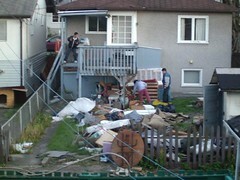 If people knew that they were in fact dumping in the yard of their longtime neighbour, and that they would have to clean it up, would they still do it? Neighborhood spirit at its finest. Kind of the opposite of one of those block cleaning drives. I should post some photos of the current state of our garage, if only to prove I haven’t taken part (though I’ve been encouraged to). I might be interested in doing a story on this. Can you feed me a little more info or give me a contact name and number. Marie — as indicated in the update above, it appears that order is being restored. Though it will be some job clearing that trash pile. Just to clarify; I didn’t mean with my earlier comment that the situation itself was funny…the way you wrote it up was hilarious, though. Basically just the last two sentences killed me. Hey Jeremy — if anybody made too light with the situation it was me.